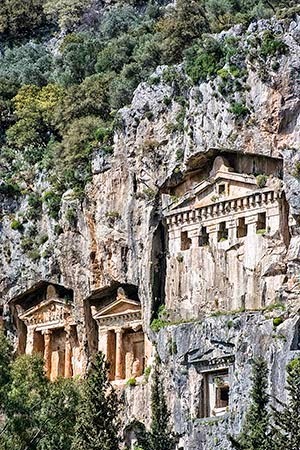 The Lycian Tombs were breath taking even after having seen so many photos. Glowing in the warm afternoon light, the tombs looked like miniature temples. 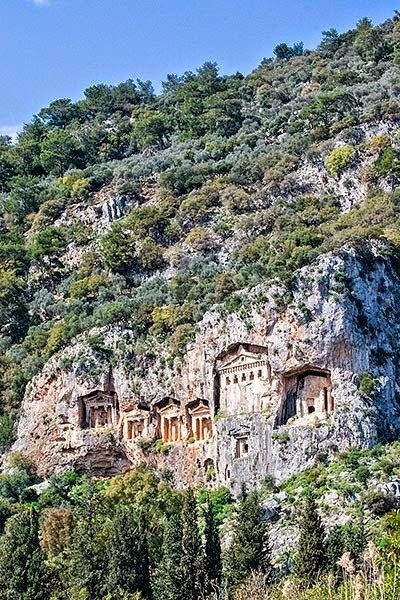 How did the Lycians carve them so high up into a vertical cliff circa 5th century BC? 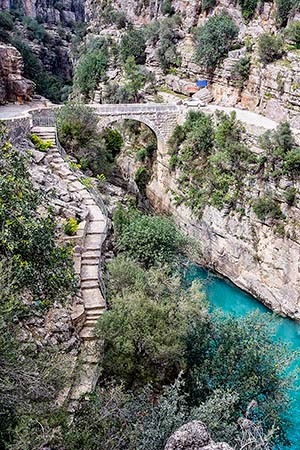 Who are the Lycians? There is a mystical aura about them. 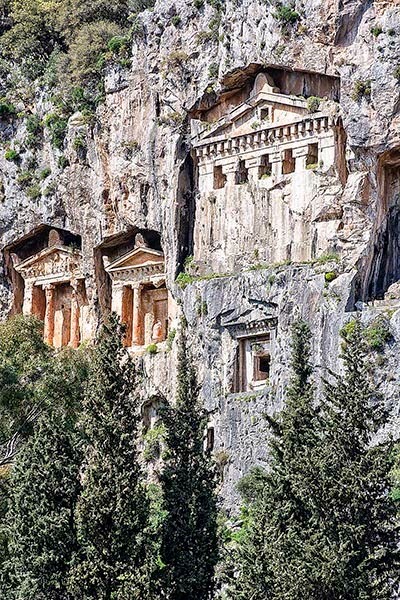 To see the Lycian Tombs in the cliffs, drive south from the park-like square along Maraş Caddesi until you see a road to the right – I believe it was Yali Sokak. There is angled parking near a small park with views along the river. Et voilà, the tombs are so close you do not even need to cross the river to see them. 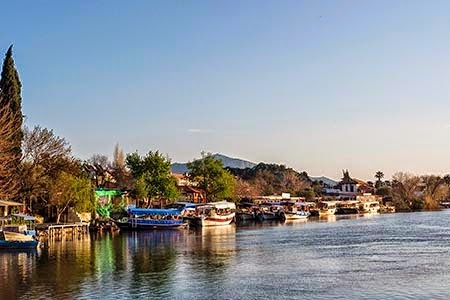 The ruins of the ancient trading city of Kaunos are a short boat trip across the river. Clearly, these tombs would only be built for royalty since the cost of carving rock to look like temples would have been enormous. Notice what appears to be a series of closely spaced, rectangular blocks projecting out of the top of the stone building. This molding is called dentil (derived from Latin dens, tooth) because they look like teeth. 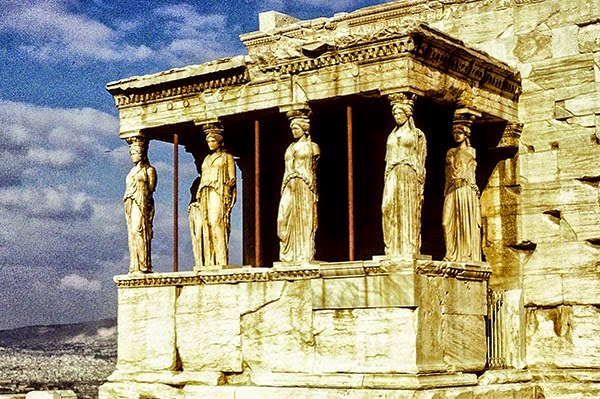 In fact, this pattern was being used in the world-famous Erechtheion in Athens Acropolis, and later emulated by many later classical temples. 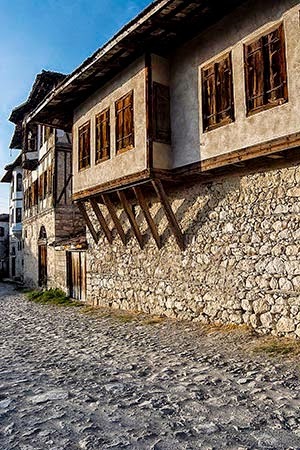 ﻿The dentil pattern is based on the support beams in buildings. In fact, all stone temples were originally modelled after wooden temples and buildings. How do we know this? From earlier examples such as the rock- cut tomb of Darius (ca. 500 BC). Is this just sharing of ideas? Or is there a deeper connection? Are you into genealogy? 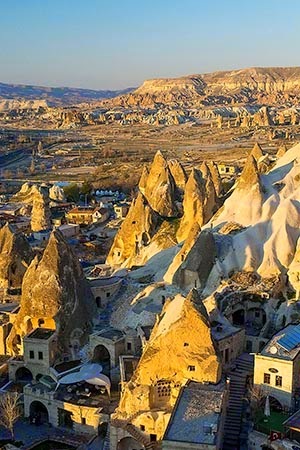 Anatolia is not a region of Turkey. It is Turkey in pre-Hellenic times – the Asian part of Turkey. Anatolia is not a single ethnic group. 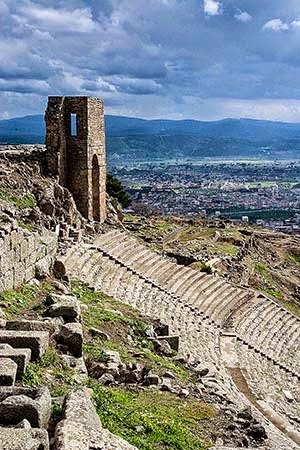 It was occupied by many groups - Hittites, Lycians, Lydians and Carians. The Hittites controlled the largest area of territory, northern Anatolia. 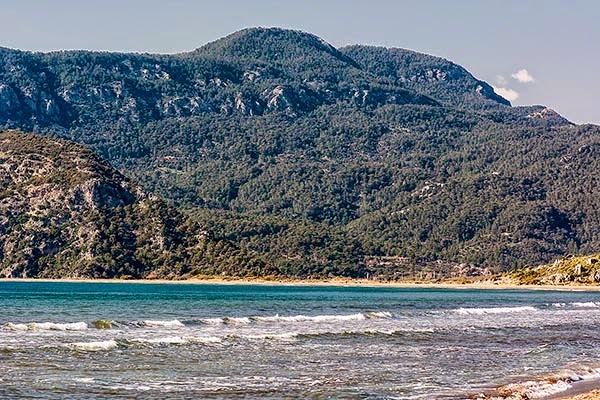 The Lycians lived in the area from Dalyan to Kaş to Phaselis. They have become almost mythical with the impression that little is known about them. We know that, like the Hittites, their ancestors came from the central Asian steppes near the Caspian Sea. But how do know where they came from? The science of linguistics started with research into a Proto-Indo-European (PIE) language. PIE diverged into multiple languages starting around 3400 BC. The two oldest (i.e. 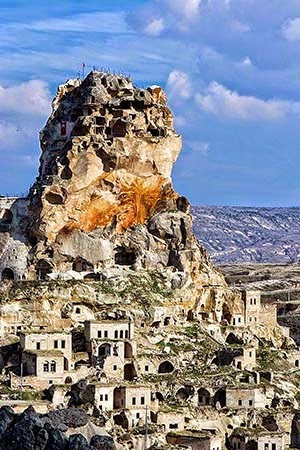 first) branches of the Indo-European language group were Anatolian and Indo-Iranian (Sanskrit and Iranian-based languages including Kurdish, a major ethnic group in East Turkey). The PIE people used to be called Aryans (now a politically incorrect name). 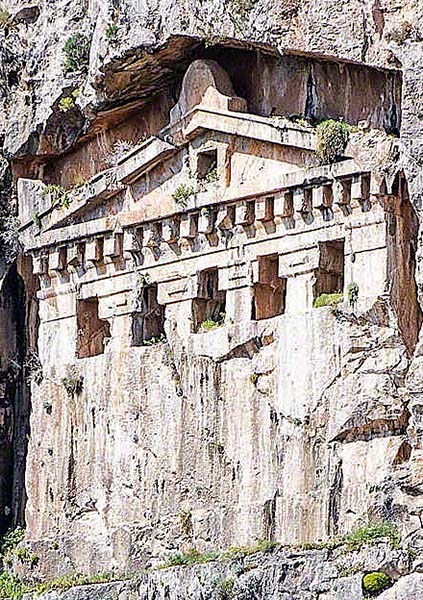 Lycia is famous for rock-cut tombs – there are still 1085 remaining tombs today, many of which were built along the streets of their cities, such as Kaş. Funerary tombs are associated with ancestor worship, a key element of the Aryan religion. The knowledge about the Aryans and their religious beliefs come mostly from the holy book, the Rigveda, composed between ca. 1500-1200 BC. The Rigveda is one of the four canonical sacred texts or Vedas of Hinduism. While the names may differ, the Anatolian, Ancient Greek, Ancient Roman, Viking and Hindu Religions all share a similar pantheon of gods, the gods of the Aryan Religion. These gods have similar spheres of influence and nearly identical symbols and weapons. Cuneiform tablets also give clues about the Aryan descendants in Turkey. In a peace treaty between the Hittite and Mittani empires, the deities Mitra, Varuna, and Indra were invoked. These are gods as they are named in the Hindu pantheon. Mithra, the god of oaths and binding, was a principal figure of Persia and the Greco-Roman religion of Mithraism. Both Varuna and Poseidon are gods protecting the ocean and sea creatures. Both have tridents as symbolic weapons. Indra, Zeus and Thor are the chief gods with a thunderbolt as weapon and a chariot as their vehicle. ﻿The Indo-European migrations took place ca. 4000 to 1000 BC according to the Kurgan hypothesis. How do we know there was a great migration? We know from the Rigveda and from the spread of the chariot, a vehicle invented by the Aryans. So it was no accident that the Romans (the Italic tribe) loved chariot racing. We also know from linguistics research into PIE throughout Eurasia. Finally, we have genetic-based genealogy. 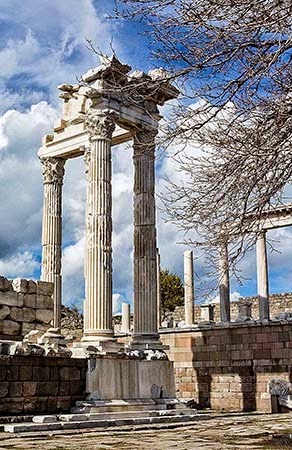 The descendants of PIE have a common gene as discussed in the topic Temple of Aphrodite in the Aphrodisias post. The first wave of the Great Migration flowed into Anatolia, founding the Hittite and Mittani empires. 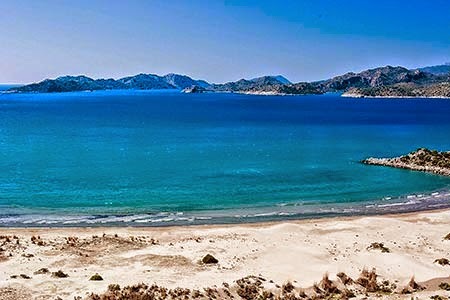 The Lycian state spanned from ca. 15th to 6th century BC. The Great Migration led to the prodigious civilizations that founded Turkey and Europe. They are part of the PIE (Aryans) that were the ancestors of the European, Persian, and Indian civilizations.